Gender equality has been a hallmark for the Nordic countries for decades and they are used to being among the top five in the Gender Gap Index conducted by the World Economic Forum. There is a political consensus that society should ensure that both men and women have the same rights, obligations and possibilities. In the media sector, however, the male dominance persists in many areas, both in the industry itself and in the output. However, in the Nordic region there are examples of steps towards gender equality in the media. 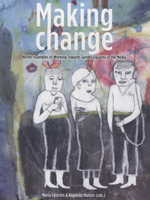 This book can be seen as a meeting point where people from different areas of the media discuss strategies for change. They speak up as individuals or as representatives with different perspectives on how to tackle the issues of gender equality and misrepresentation in the media.